Do you have lips that are in a constant state of dry, cracked mess crying for some TLC? We know the solution to that is to hydrate them with lip balms, glosses and regular exfoliation, but what's the best products to deliver these results and give you soft supple pouts? I'm always in search for better products to rescue my super-duper dry lips, which are exposed to the crazy Melbourne weather and the daily air conditioning at work. I have to exfoliate my poor pouts every day while showering because of the dry flaky skin but this makes them slightly raw afterwards and I need rich nourishing products to nurse them back to suppleness and not so bee-stung looking (sorry - overly fat lips do not look good on anyone other than Angelina Jolie, and lets leave it at that). I find lip balms do an okay job but wanted to amp up the treatment factor and looked around and found this local Aussie goody. Ingredients: Octyl Methoxycinnamate, 4-Methylbenzylidene Camphor, Butyl Methoxydibenzoylmethane, Hydrogenated Polyisobutene, Ethylene/Propylene/ Styrene Copolymer, Butylene/Ethylene/ Styrene Copolymer, Octyl Methoxycinnamate, 4-Methylbenzylidene Camphor, Butyl Methoxydibenzoylmethane, Tocopher yl Acetate, Aloe Barbadensis Leaf Juice, Flavour (Aroma) Menthol. Applies like a gloss but nourishes and protects like a balm. Shine and protection. Win-win! Contains vitamin E, aloe vera that gives deep long-lasting conditioning properties - easily gives me over an hour of relieved lips in the office which is almost double of most other lip products I've tried. Gives glossy high shine - I love slicking this over my favourite lip pencil colour to add an new dimension to lip products. Has UV filters to protect those your pout. You may not realise but your lips can get burnt after prolonged exposure in the sun, giving rise to more flaky lips which could lead to dis-colourations along the edges of lips or worse - abnormal growths that transforms to nasty things cancer on, so sun-protection on lips is a MUST like every other part of your body. Does have a slight tingling feeling upon initial application from the menthol - I'm not sure I like the sensation but I'm willing to put up with it for all the other goodness it provides me. Great hygienic squeeze-out tube applicator. No wand applicators that could contaminate products by dipping back into product after on-going use. Tip: make sure you keep your hydration levels up during the day by drinking plenty of water to keep your puckers smooth. Whenever I don't drink enough, I definitely feel my lips going downhill faster than usual. 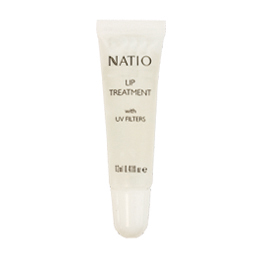 I always reach for this lip treatment when my lips are chapped or cracked and need extra TLC. Believe it or not, I think this stuff is better on my lips than Lucas Papaw ointment and I love that for everything. I keep one in my handbag, another at home and a third at my desk to make sure I always have access to it. What lip treatments have you tried for super dry lips that flake every day? I'm keen to try other products that I may not have come across that do just as well and doesn't have the menthol tingling sensation. Rating: 9.5/10. My can't live without for the past Winter season. RRP A$9.95 at Natio Online, Myer, David Jones and leading pharmacies. Hmmm have not tried the paw paw ointment yet! Melbournite - go now to try the papaw stuff. You can get it at any Target or supermarket now. Had to rely on Natio again today... I didn't drink for 1 hour and my lips completely dried up this afternoon.